GUISE. 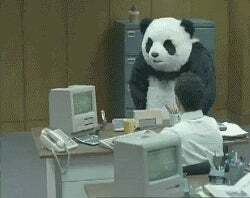 The angry-panda-destroys-computer gif, objectively one of the best gifs in the entire history of the internet, is originally from a 2010 Egyptian commercial... for CHEESE. Please don’t tell me I’m the only one who didn’t already know this fun fact. Because then I’ll be <s>embarrassed</s> sad. Also can we use HTML here? We’ll see! So, dear cheesy lentils*, what’s on your Saturday vagenda?